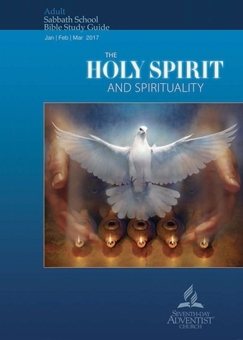 COMMENTARY ON "THE HOLY SPIRIT WORKING BEHIND THE SCENES"
This entire lesson leads the reader to completely unbiblical conclusions, but the deception is so subtle that, unless one understands Adventism’s skewed doctrines of the nature of God, the nature of man, and the nature of our rebirth, the errors are hard to identify. I will write a summary overview of how this lesson teaches unbiblical conclusions, and I will close with some links for further study explaining in more detail how Adventism differs from Scripture regarding these core beliefs of truth and reality. This lesson writes from the Adventist understanding that the three persons of the Adventist “Godhead” are not actually One Being. In fact, Adventism is clear (at least in its inner circles and among its scholars) that Ellen White’s “heavenly Trio” and the “Three Worthies of Heaven” are NOT the same as the classic Christian Trinity. The actual belief among Adventists is to say that there is One God, but the understanding is that this One God is more like a unit of three distinct beings. In fact, many Adventists teach their children that the “Godhead” is similar to a family: Father, Mother, and Child all of whom share a name, a purpose, a united will, but who are not of the “same substance”. In other words, they are distinct beings, not One God expressed in three persons. Perhaps the easiest way to identify this serious heresy is to point out that Adventists have taught consistently that the Lord Jesus gave up His attribute of omnipresence when He took a human body. In fact, they teach that He had to send the Holy Spirit to the earth because He could not longer be everywhere at the same time. This teaching is a grave error and clearly identifies Jesus as NOT “fully God”. Omnipresence is an attribute of God. It is, in fact, an incommunicable attribute—one that cannot be shared with creatures—but is only an attribute of God. Without this attribute, Jesus is no longer God. Instead, he resembles more of a pagan demi-god—a half-god, half-man hero with superpowers but who is not the same as the Top God who has no humanity. This misunderstanding of Jesus’ deity results in a misunderstanding of the Holy Spirit and of the Father as well. In fact, the founders of Adventism were strongly anti-trinitarian, and this heretical view still influences Adventism. Even though Adventism has developed a “trinitarian” statement of belief, they don’t mean what classic Christianity means when it talks about the Trinity. Adventists absolutely do NOT believe that the three Persons share one substance. In fact, they view the Holy Spirit as distinct from the Father and the Son, and in this week’s lesson they even say the Spirit wasn’t as active in the Old Testament as in the New. However, when one understands that the Trinity is of One Substance, that God is ONE, when one reads carefully through Scripture and sees that the work of the Father and the Son and the Spirit are repeatedly portrayed as one work, one sees that we cannot separate the Spirit from the Son from the Father. No, our triune God is not a modal god, sometimes appearing as one person and sometimes another, but He is One Being (yes, it’s a mystery we cannot explain), and the Bible names them together in so many places when the work of God is being described. After the skew that comes from an anti-trinitarian view that yields a tritheism instead of a triune God, the second major skew is the Adventist view of the nature of man. Because Adventism doesn’t believe man has a spirit, there’s absolutely no way it can teach or understand the new birth. In other words, Adventism is incapable of explaining the truth about how the Holy Spirit works in us. The lesson says the Holy Spirit helps us overcome sin and convicts us of sin. In fact, He does do that. Absolutely. But the real work of the Holy Spirit in believers is related to our becoming spiritually alive. When we place our faith and trust in the Lord Jesus and His finished work on our behalf, our spirits which are born dead in sin become alive. We are re-connected to God and His own life, and the Holy Spirit seals us. He indwells us—and yet it is not just the Spirit who lives in the spiritually alive; the entire Trinity is in us and we are in God! If anyone loves Me, he will keep My word; and My Father will love him and We will come to him and make Our abode with him. Here is only one example of the fact that, wherever we find the Holy Spirit at work, we also find the Father and the Son. We cannot separate His work from the work of the Father and the Son. To be sure, the roles are different, but the work is the same, and all three share all the attributes of God. When a human being believes in the Lord Jesus his spirit, which is separate from his body, comes alive by God’s own power. We pass from death to life at that moment (Jn. 5:24). Without understanding this fact, without understanding that the Holy Spirit seals those who have believed and indwells them, it’s impossible to talk about the work of the Spirit in man. He doesn’t primarily help us to become good; He makes us alive. Our ability to slowly overcome sin through the power of the Holy Spirit is something available ONLY to those who have placed their entire trust and faith in Jesus alone, admitting they are depraved and unable to please God, and have accepted His blood as the payment for all their sins—past, present, and future. Moreover, it is not this overcoming of sin that is the “thing” that marks the saved. Rather, it is the coming to spiritual life—a real, not a figurative moment. Finally, the Holy Spirit is never our example. How on earth are we to follow the example of God the Spirit? The only “example” we have of how to live a godly life is the incarnate Lord Jesus whose life is an example—but ONLY to those who have been made alive by grace through faith in the Lord Jesus. As believing, born-again humans, the example of the Lord Jesus suffering, honoring His Father, and living for His glory is the one we follow. The Bible never gives us God the Father or God the Spirit as examples. We embodied creatures cannot follow the example of Spirit. In order to think properly about the Holy Spirit, we have to understand He is of one substance with the Father and the Son. We have to understand that we are depraved humans, and the Spirit’s work in us is the work of the triune God. For further reading, here are two links that shed more light on this subject. A closer look: Trinity or Tritheism? Copyright 2017 BibleStudiesForAdventists.com. All rights reserved. Revised January 6, 2017. This website is published by Life Assurance Ministries, Camp Verde, Arizona, USA, the publisher of Proclamation! Magazine. Contact email: BibleStudiesForAdventists@gmail.com.